You hear the name Glimmer Casino, and some expectations come in mind. Sites with such names are almost always full of bright colours, unnecessary shiny and flashy images, and lots of other things to promise you a pretty mean headache before you even start playing. However every rule has its exceptions, and pleasingly, Glimmer Casino is one of them. It’s not that the site doesn’t stick to its theme, it does, there are glitter balls and everything, but by keeping to a dark and subtle colour scheme, Glimmer Casino manages to maintain a sense of class and a genuinely attractive look. Glimmer Casino has a host of promotions for you to take advantage of once you have become a part of their online community. Spin and Win, Monday Madness, Double Your Money, and Cashback Day are just some of the promotions you can enjoy once you have signed up to Glimmer Casino, as well as seasonal and sporadic offers to give you a reason to keep coming back. All in all, a good mix of promotions, not earth shattering, or ground breaking, or anything else that will damage the floor beneath your feet, but certainly a good selection. 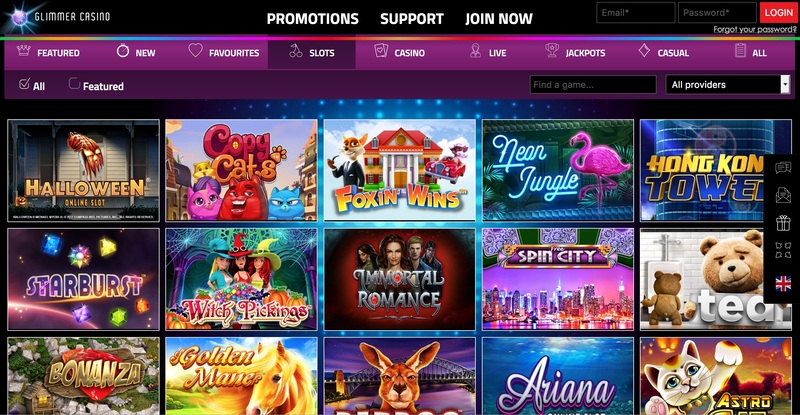 If you’re after Starburst, Gonzo’s Quest, or any of the other most popular slot games, you won’t find them here, but in fairness, you almost definitely already have a favourite site to play those on. What Glimmer Casino offers you is an excellent mix of games you will know, and games you will not. Animated slots, 3D slots, TV and movie themed slots, sports themed slots, and many others are here to discover, so whatever you’re into, you’ll find something to tickle your fancy. Casino games include a plethora of poker, a smorgasbord of roulette, and anything else you could possibly want from a casino section. Again, not the largest selection, and maybe not containing your personal favourite, but there’ll definitely be something for you to enjoy. Sometimes sites try too hard, and sometimes it’s nice when the stages of a VIP scheme are called bronze, silver, gold, platinum, and diamond. Some may say it is overused, but against some of the attempts to be ‘different’, sometimes the most used way is the most used for a reason. As you would expect, the higher you climb, the more benefits you get, and if you make it all the way you up to diamond, you’ll enjoy a personal account manager, personalised gifts, a VIP support helpline, anniversary presents, and many other perks. The lesser levels also have their benefits, but if you can make it up to diamond, it’d be worth it for you. Glimmer Casino isn’t doing too much that is new, but it’s doing everything very well, and sometimes consistency is what sets you apart. Many sites are consistently okay, maybe even consistently good, but Glimmer Casino is consistently very, very good. Whether you are a newbie, or you’re a seasoned old-timer in the world of online casino play, you are bound to find something of interest at Glimmer Casino, well worth a look for players of all levels.